What's the best deal on the island? Well, what are you looking for? Beachfront, bay front, rental income, small house or large, house or condo? Just about any market segment you can name has at least one decent deal floating out there right now. While your idea of a "deal" might be a little different than mine, the best way to tell is come look at property with me! I've been in virtually every house for sale on the island, and I'm happy to give you my opinion about anything you see online, so just call or email me. You can access the whole MLS (Multiple Listing Service) from this website by going to the "Property Search" button above. 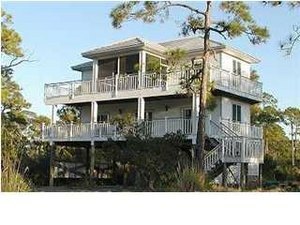 I work primarily with buyers, and can show you anything listed by anyone on St. George Island, in Apalachicola, or in Eastpoint. "Coastal Affair," top right, MLS# 110932. Nice views, great street presence, and well-priced at $325,000. This would be a nice personal home, but would also do well as a monthly rental. "Majestic Bay," middle right, MLS# 209019. In the Plantation, on an acre, great pool, with established vacation rental income. For $395,000, this is a nice package. "Simon Says," bottom right, MLS# 205350. 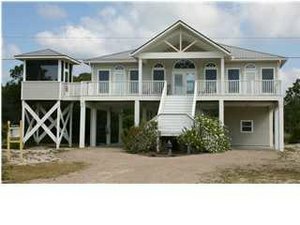 Well priced home ($425,000) with a nice gulf view, on the vacation rental market, very nice open floor plan. "Gulf Stream Dream," MLS# 203321. I'm out of picture slots, so you'll have to go to Property Search to see this one. In the Plantation, priced at $449,000, very nice open floor plan, with fireplace and a great calm ambiance. "Captain's Bridge," MLS# 107738. Go to Property Search to see pictures of this one, too. 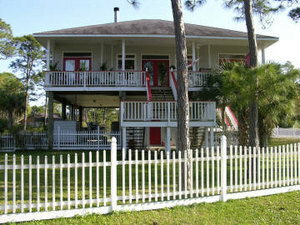 If you like the traditional Florida style cypress siding, this bayfront house on the East End is a charmer. Asking $450,000. And, there are 16 other single family homes in this price range that you might think are even better than these!